Buy Aroma Magic Help Me! 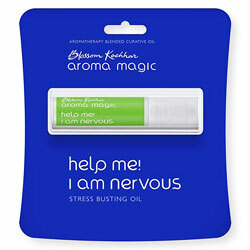 I Am Nervous - Stress Busting Oil- Relief from stress, strains & nervous tension. Relief from stress, strains and nervous tension. An aromatherapy formulation made from essential oils of lemon, jasmine, vanilla and rosewood. Potent blended of pure and natural oils helps to release the stress, strains and nervous tensions. You feel elated and ready to face the day as calm your nerves. Safe and natural with no side effects.